I have to begin by saying TalkTalk have amazingly good customer service skills. I am brilliant at shredding and recycling paperwork, meaning that when I need an account number for a website I am a member of, I can never find it. They were very helpful though, providing me with it again after asking a few security questions! I usually have issues with downloading software that is meant to be simple to use- I always end up getting confused by what's on offer and ask Gadget Dad to it instead. However, now that the Brats are both using my ancient old laptop to search for homework answers and to play games, I have found out all too recently why a filter is absolutely imperative. Just 2 weeks ago, I managed to lose my files thanks to Littlest. All he did was to spend 5 minutes on Google searching for "games". On finding some, he downloaded lots- all from a website that infected my laptop in half hour, and meant I had to have it completely reloaded by Gadget Dad. The Homesafe is available- completely free- to TalkTalk customers via their easy to use website, and there is no need to download a thing, which stops your hard drive from being clogged up (great if yours is ancient like mine). You can set it to block certain web addresses, and it automatically bans certain search terms- great if your kids are of an age where they may look for dodgy websites. 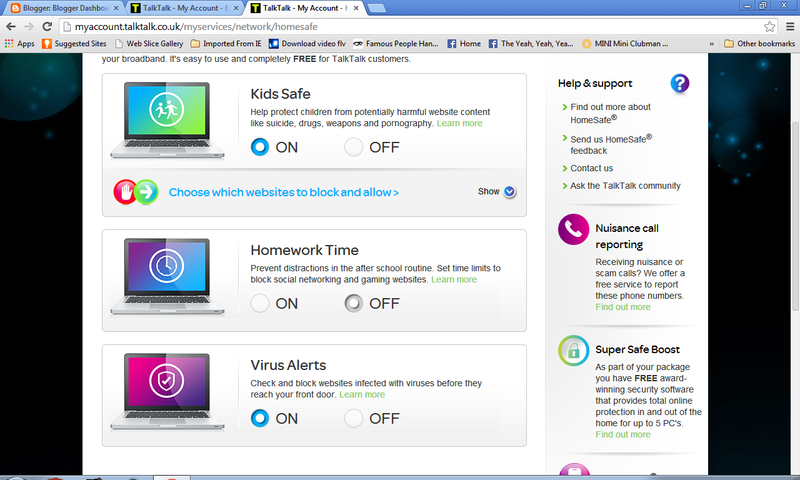 For older kids who are easily distracted from homework, TalkTalk has them covered with the Homework Time setting, which lets the parent set limits to how long they can use social media and other such websites. It's like a teacher on your PC! As for Littlest and his ability to download every virus known to man, TalkTalk stops that happening, by blocking websites which contain viruses. It is harder and harder in the digital age to stop children from using the net- gone are the days when we sat down the local library, looking through reference books for homework inspiration. It's hard to let them use the net like their peers without feeling you need to watch them at all times. The fact that its free for all TalkTalk customers and can be altered at will by the password holder is such a great feature. It can also be used on any device you have linked to your account for all round protection from Net Nasties. I recommend it for parent's everywhere.